Today’s freezer item was 1 pound of pork sirloin that I froze back in June. Yes, I know I’m pushing it using meat that has been frozen for 6 months, but if you package it correctly there’s no reason it can’t last that long. There are two very important things to keep in mind when storing meat in the freezer. The first is to wrap it in usable portions in plastic wrap, making sure to push out all the air. Then it should have a secondary covering such as a Ziploc freezer bag. Make sure to push all the air out of that too. This will prevent freezer burn. The second important thing is to store the package as far away from the door as possible. You don’t want extreme temperature fluctuations to affect the meat, otherwise damaging ice crystals could form. "Damaged" meat will be dry when cooked. 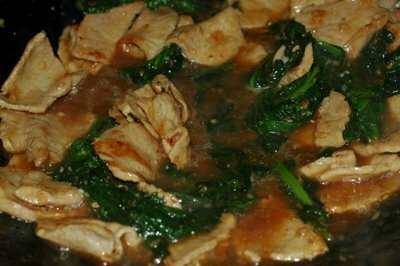 I used one half of the pork to make a saucy pork and kale stir-fry seasoned with fermented yellow beans for Sonny. Normally this type of stir-fry would be eaten atop rice noodles, but steamed rice does just as good a job at soaking up the sauce. The other half of the pork went to red curry, which is Hubby’s favorite Thai dish. I’ve been a little hesitant to post about red curry because the way I like it is usually not the way it’s served in restaurants. 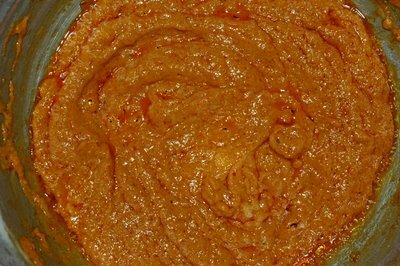 The red curry I grew up eating was not thick and sweet. Of course it does have a hint of sweetness from the coconut milk, but sweetness should not be the predominant flavor. As for the thickness, I think many Thai restaurants serve their curries thick because most Americans would probably be turned off if they saw a layer of oil topping their curry. But that’s the way it looks when it’s properly prepared (and just because you don’t see the oil on top doesn’t mean it’s not there). Of course you could just skim off the oil. As you can see, I didn’t bother. I figured I can eat very healthy for the next 5 days to make up for one not so healthy meal. Everything in moderation, right? 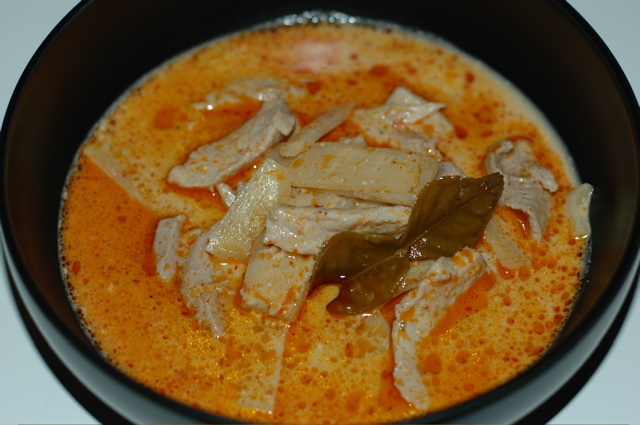 Coconut cream: the key to a delicious red curry. 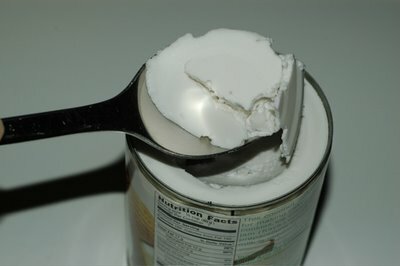 In a heavy bottom pot on medium-low heat, add the coconut cream. It will sputter and pop, so be careful. Stir it occasionally and watch that it doesn’t burn. Turn down the heat if necessary. Cook until the oil separates out and it thickens. This could take about 5 to 7 minutes. Add the curry paste and mix it well to dissolve it in the coconut cream. 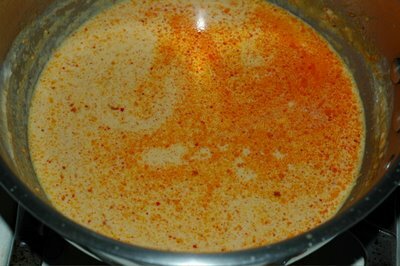 Cook it with the cream for 2 to 3 minutes. 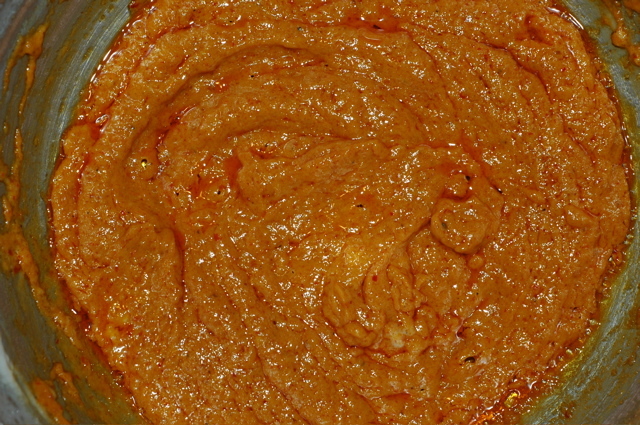 The oil will continue to separate out and the mixture will be quite fragrant. Add the coconut milk, sugar , broth or water, lime leaves, galangal and bamboo shoots. Bring to a boil, turn down to a simmer and season to taste using fish sauce, if needed. This would be a good time to skim the oil, if you care to. Once you get the flavorings to your liking, add the meat. Avoid stirring. Just make sure the meat pieces are separated and can simmer in the liquid. It’s done when the meat is just cooked through. Turn off the heat and allow it to sit for about 10 minutes before serving with steamed jasmine rice. See how the oil separates out? That's what you want. 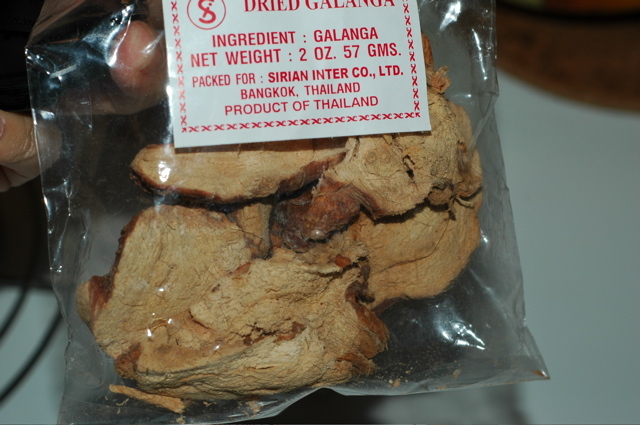 Dried galangal can be found at any Thai-Viet grocer. Before adding the meat or veggies skim the oil, if you like. Enjoy with a bowl of jasmine rice!